The Purple Finch (Carpodacus purpureus) is a raspberry-colored finch, not "purple", as the term is used today. It has a heavy conical bill for cracking seeds and a head that is peaked, in contrast to the flatter-headed House Finch with its vermillion or Chinese red coloration. The Purple Finch breeding population in the eastern and northern states of the U.S. plummeted in the latter part of the twentieth century, probably as a result of competition from the invasive House Finch. The Purple Finch is still a winter resident (and feeder bird) in many areas of the continental U.S. east of Colorado (except for the Florida peninsula), and there are regular winter invasions of these finches in the east as a result of poor conifer seed production. The Purple Finch sings a rapid, warbling song often from the top of a tree. The song is highly variable, even in the same individual, and sometimes contains fragments of other bird songs (e.g. the Purple Finch). The warbling phrases are interspersed with a sharp, metallic "pic". The Purple Finch is a breeding bird across a swath of Canada south of Hudson's Bay stretching west from the St. Lawrence River to the Yukon. The bird is a permanent, but no longer common resident, in the eastern U.S. south to Virginia and west to the Great Lakes, and on the Pacific Coast. The wintering range encompasses all states of the U.S. from Colorado east, excluding the Florida peninsula. The House Finch is a less chunky bird, with vermillion crown and breast on the male, distinct brown streaking on the flanks, brownish (not red) nape, and a flatter head than the Purple Finch. The female House Finch is brown-streaked, lacking the white stripe behind the eye. The Cassin's Finch is quite similar to Purple Finch. The male has less of the rosy wash on the nape and a few fine streaks on the lower flanks. The female has almost no evidence of a white streak behind the eye. 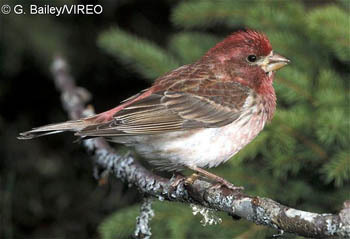 The Purple Finch nests mostly in coniferous trees, especially dense cedars and spruces, located in moist forests, bogs and landscaped and orchard areas. The Purple Finch eats buds of trees and calyxes at the base of flowers, along with seeds.